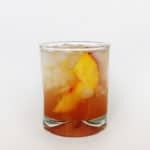 Made with muddled peaches and local honey, this old-fashioned makes the perfect nightcap for the summer months. In a cocktail shaker, combine bourbon, honey syrup, peach, lemon juice and a dash of bitters. With a muddler or the back of a spoon, gently crush the fruit to release its juices. Strain mixture into a rocks glass filled with crushed ice. Top with club soda or ginger ale and add a peach slice for garnish. Serve immediately.